You're probably thinking who uses a toaster oven these days, right? When I first was presented the opportunity, I thought, man, I haven't seen a toaster oven in someones house in a very long time! Fagor was kind enough to send us a toaster oven for review. Living in Las Vegas, we try not to use our conventional oven too often, if at all because it just adds heat to the house and we have enough of that with temps in the 100's. So I thought this was a great opportunity to give this a try. It is a bit large, so you must have the room for it. Our kitchen is pretty small and we had no counter room, but we have a large dining area where we were able to buy a kitchen cart and put it on that, which worked out great. After using this toaster oven for the last two months, I'm very impressed with it! Between this and the BBQ, I don't think I have used the conventional oven at all. I have made everything from bacon, sandwiches, pizzas, salmon and yes, I even roasted a whole chicken like the picture above. I loved it! It was so simple to use and a breeze to clean up. 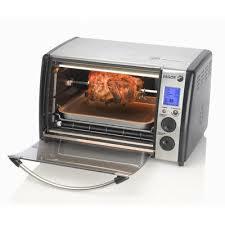 Fagors Dual Technology Digital Toaster Oven gives you full- size oven performance right on your countertop. With easy to use dials, a digital control panel and 10 pre-set cooking programs, you're able to cook your meals, smarter, faster and more conveniently. This incredibly versatile unit fits 6 slices of toast, a 5 lbs. Chicken or a 12 " Pizza and its designed with Quartz and Halogen heating lamps which allows the unit to cook faster and more efficiently. Totally economical and efficient!